I arrived at my nephew's baseball game last night, and after being greeted by my brother, he turned to my nephew and said, "Oh, look. There's a celebrity at your game. Aunt Salena." It's an apple of discord, my not liking going to baseball games. Yes, I know, I should be there for the kids. Yes, I know I should go to cheer for them. But my brother has three boys who all play baseball. Do you know how many games that is?? I did want to go to this one though, because the youngest was playing and I've hardly been to any of his games; plus, earlier in the day he asked if I was going. Needless to say, his smile was a mile wide when he saw me. Other than the fact that I abhor all things sports-related, I usually don't go to the games because they're held at fields perched on acres of dirt, often in the middle of the day when the Arizona sun is at its fiery hottest, and without a square foot of shade available. Some people bring their own shade - they set up tents and umbrellas, bring coolers and lawn chairs. Uh, yeah, I don't think I'm interested in eating a sandwich and drinking a can of soda while inhaling dust kicked up from the feet of forty nine-year olds. It's bad enough that my shoes are filled with dirt by the time I get to the bleachers. I'm really not cut out for any outdoor activities, even those that require passive participation. One of the other coaches, a friend of my brother, said when he saw me, "Oh, you came out of the house." Well, yeah, because the sun has gone down. Hasn't anyone told you I'm vampirical? "At least it's cool." is what my mother kept saying. Sure, 75 is cool when you compare it to 115, but it's certainly not what I would call cool. I guess there's no hope of my nephews taking up snow-skiing as a sport since they live in the desert. 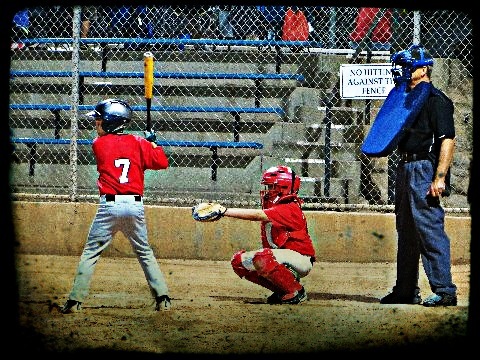 As for the game, I don't know who won because I don't know the rules (nor do I care), and they were both in red uniforms, so I couldn't even tell which team was scoring what runs, but I did see my nephew get a great hit and also witnessed him catch a fly ball in left field; effortlessly, right into his glove. Which in the end, I guess was all worth a little dirt in my shoes.